Through the Looking-Glass, and What Alice Found There (1871) is a novel by Lewis Carroll, the sequel to Alice's Adventures in Wonderland (1865). Set six months later than the earlier book, Alice again enters a fantastical world, this time by climbing through a mirror into the world that she can see beyond it. 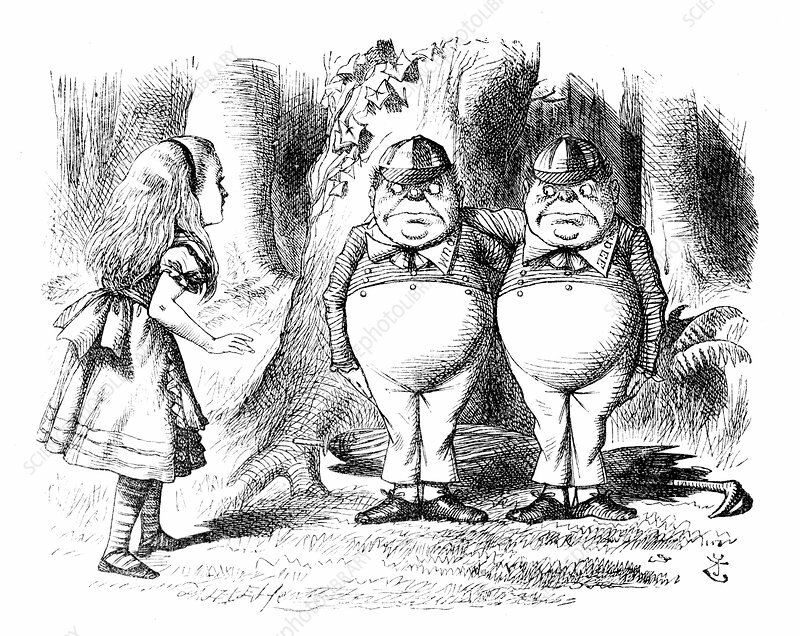 Tweedledum and Tweedledee are fictional characters in an English nursery rhyme and in Through the Looking-Glass, and What Alice Found There. The brothers agree to have a battle, but never have one. When they see a monstrous black crow swooping down, they take to their heels. The names have since become synonymous in western popular culture slang for any two people who look and act in identical ways, generally in a derogatory context. John Tenniel (February 28, 1820, February 25, 1914) was an English illustrator, graphic humourist, and political cartoonist prominent in the second half of the 19th century.